The architecture includes the Java Gateway, which must be running. 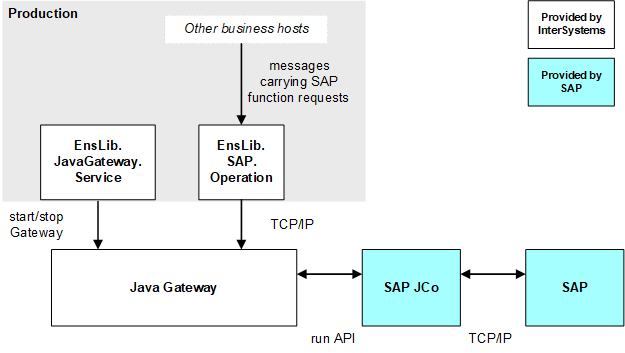 EnsLib.SAP.Operation, which communicates via TCP/IP with the Java Gateway. EnsLib.JavaGateway.Service, which starts and stops the Java Gateway. This business host performs an additional function: its settings indicate the location of the Java Gateway. When correctly configured, the EnsLib.SAP.Operation business host retrieves those settings and uses them. Thus it is not necessary to set any environment variables. It is not necessary to manually create message classes to carry the SAP requests within the production. InterSystems provides a CSP page that you can use to generate the message classes.